Eaglehawk Neck (pop ~200) is a narrow isthmus at the top of the Tasman Peninsula. In convict times, it was manned by guards who ran a chain from one side of the neck to the other, and tethered savage dogs to it to stop prisoners escaping. Eaglehawk Neck overview, 5.2Mb QuickTime movie. Four spectacular natural formations, all in close proximity, are a short drive from the neck. 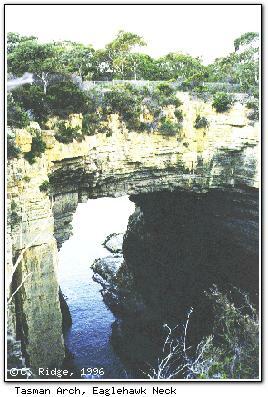 Tasman Arch is a natural arch between two cliffs cut by wave action. At the Devil's Kitchen, hear the waves roar onto the rocks hundreds of feet below. The sea rushes in under the rock and shoots into the air at the Blowhole. But possibly most spectacular is the Tessellated Pavement, which visitors could almost swear was laid by a bricklayer but is again due entirely to the sea. Walks from Eaglehawk Neck include Clyde Island (1½ hours return) at low tide, along the cliffs to Waterfall Bay (2 hours return) or a more challenging 7 hour hike to Fortescue Bay. It is also possible to go on chartered tuna fishing tours, or guided scuba diving or snorkeling tours to fascinating locations. A scenic drive provides views of The Lanterns and Hippolyte Rock, off the coast. Most visitors stop at Eaglehawk Neck on their way to or from Port Arthur. The neck is a one hour drive from Hobart, and one 4-star and one 3½-star accommodation facilities (RACT rated) are present.